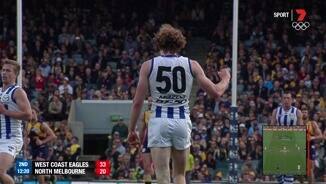 North Melbourne has won four more clearances and generated one more goal from intercepts. 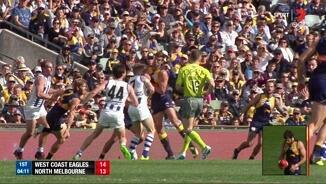 But, West Coast has been too efficient launching six more goals from stoppages. North Melbourne has now kicked the last three goals, however West Coast have kicked 8 of the last 13 goals. The Eagles continue to dominate the clearances, leading the count 8 to 3 this quarter. Luke Shuey has been a standout with 9 clearances alone. West Coast has won just two more clearances today, but have created 6 more goals from this source. 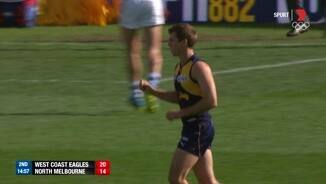 West Coast's small forwards Mark LeCras and Jamie Cripps have relished today. They have had 8 and 7 score involvements respectively, 513 metres gained and 2 goals each. North Melbourne has won 15 intercept to 9 in their attacking half, but have not capitalized launching just one goal from this source. West Coast's kicking efficiency has given them an advantage so far. It is 15 per cent greater than North Melbourne's and has allowed to generate a goal from 33 per cent of inside 50's. Kangaroos InterchangeMason Wood and is possibly out for the game. North have won 7 intercepts in their defensive half this quarter, but have generated just one goal from this source. They have created a score from just 39 per cent of inside 50's. West Coast continue to dominate the uncontested possession count 45 to 22 this quarter. They have created eleven inside 50's for the quarter, launching five scores to nil. West Coast has been able to find targets inside 50 and convert their opportunities. They have created nine marks inside 50 and have a goal kicking accuracy of 90 per cent from set shots. West Coast has created four intercepts in their defensive half this quarter and have launched both their goals from this source. Matt Priddis already has a gamehigh 350 metres gained and 10 tackles. West Coast lead the tackle count 47 to 36. West Coast generate the second highest points per clearance in the competition. Today, they have won just one hitout to advantage but have launched six goals from 25 clearances. North Melbourne has launched a score from just 33 per cent of inside 50's, which is 15.2 per cent below their season average. 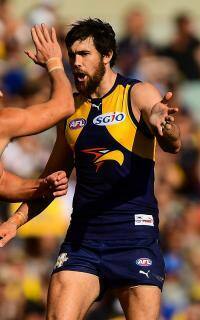 West Coast have capitalized by launching four scores from their defensive 50. Kangaroos InterchangeFarren Ray and is possibly out for the game. Kangaroos InterchangeRyan Clarke off due to the blood rule. This quarter, North Melbourne have launched two of their three goals from intercepts in their attacking half. They have created 7 more intercepts in their attacking half than West Coast. North generate the second highest points per game from centre clearances this season. Today, they have won 80 per cent of these clearances, but are yet to score from this source. Todd Goldstein recorded a careerhigh 22 hit-outs in the first quarter. However, West Coast has won four of the last six clearances have created one more goal from this source. Jack Ziebell has been influential with 10 disposals and 2 clearances. Whilst, Jeremy McGovern has restricted the Kangaroos with five intercepts including four contested marks. West Coast have built a lead on their efficiency that quarter. Their kicking efficiency was 21 per cent higher than the Kangaroos and despite having 9 less inside 50's, they launched a score from 100 per cent of their entries. West Coast is looking to transition the ball predominately by foot. They have a high kick to handball ratio of 2.65 : 1, which is almost double their season average of 1.31 : 1. West Coast has created just seven intercept possessions, yet they have launched three scores from this source. 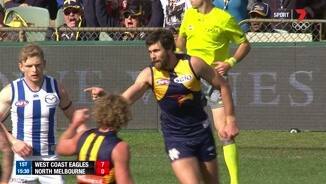 Josh Kennedy has once again been the main beneficiary with 2 goals and 2 behinds. 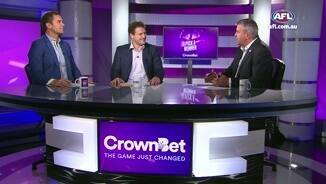 Todd Goldstein is having an influence in the early stages winning 80 per cent of hitouts. Trent Dumont has benefited with three clearances. However, North has converted just one of these clearances into a goal. It has been a relatively stopstart beginning to the game. Both teams have created just two inside 50's from clearances, whilst North has already created seven intercept possessions. North Melbourne has won five of the first eight clearances, however West Coast is applying greater pressure with ten tackles to two. North Melbourne won the first three clearances of the game. However, West Coast's disposal efficiency is 92 per cent and as a result, they have launched two scores from both their inside 50's. West Coast has generated more inside 50s than NorthMelbourne in five of the past six games between the sides at Domain Stadium, averaging 12 more entries. The Kangaroos have scored 16 points per game from centre bounce clearances this season. This ranks them second of all teams in the competition. Welcome to Domain Stadium for the West Coast Eagles v North Melbourne Round 16 clash. WEST Coast has vaulted to fifth on the AFL ladder after a convincing 32-point win over a struggling North Melbourne at Domain Stadium. In a game where both sides were fighting for legitimacy it was the Eagles who led from start to finish to claim their first win over a top-eight side this season, winning 16.8 (104) to 11.6 (72). 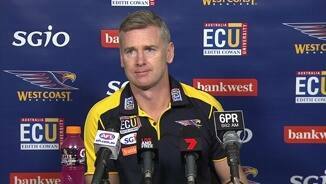 Eagles coach Adam Simpson was very satisfied with his side's performance. "We were really pleased with the brand of footy we played today," Simpson said post-match. "It was a tough, hard slog. Of course North would respond. I know they lost a few players as well, so we take that into consideration. But I thought we got the job done." The Kangaroos have now lost five of their last six, all against top-eight opponents. They have slid from the top of the ladder after round 12 to eighth just four weeks later. 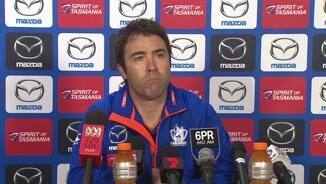 North Melbourne coach Brad Scott was still upbeat despite four losses in a row. "We have played four pretty good teams in the past month and really I didn't walk away discouraged that our best wasn't good enough to win those games," Scott said post-match. "We just have to keep working on that - rediscovering our best and getting some personnel back." Luke Shuey and Matt Priddis led the way in the midfield with 31 contested possessions, 14 clearances and 17 tackles between them, while Andrew Gaff was damaging on the outside with 25 disposals and a goal. Shannon Hurn's kicking out of defence was flawless, with all 16 of his kicks hitting the target, including a rare shot on goal. Jeremy McGovern took five contested marks in defence and was resolute throughout. Josh Kennedy bagged four goals but could have claimed the lead in the Coleman Medal if he didn't miss four other chances. The Kangaroos had few winners on the day. Ben Brown was excellent up forward kicking four goals, including two freakish efforts, and Andrew Swallow fought hard with 25 disposals, 12 contested, in his 200th game. Trent Dumont was also a good contributor with 21 disposals and a goal. Simpson said mid-week that the Eagles needed to at least match or better the Kangaroos in the contest if they were to win on Sunday, and they did just that with a fierce display around the ball. They only lost the contested possession count by four and the clearances by five despite Todd Goldstein's 65 hit-outs. Simpson was very pleased with Scott Lycett's competitiveness. The Eagles also laid 77 tackles to 60. "I thought on occasions we've been found wanting in that area for longer periods," Simpson said. "So I thought we met the challenge pretty well." The Eagles were far more efficient going inside 50, yielding seven more scores from the same number of entries. The Kangaroos did not help their own cause. West Coast kicked four goals courtesy of 50m penalties the Kangaroos gave up through either ill discipline or carelessness. Scott had stern words with his players after the game about those incidents. 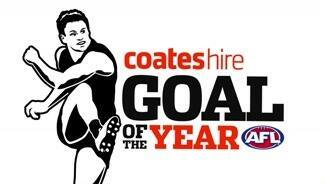 "You don't want to give up four goals to free kicks and 50m penalties," Scott said. "We play an aggressive combative sport and there is a fine line you walk, and the difference between hard and combative versus undisciplined is quite thin at times and we were on the wrong side today." The Kangaroos injury toll also continues to mount. They entered the clash without star trio Daniel Wells, Jarrad Waite and Shaun Higgins and then lost Nick Dal Santo pre-game due to illness. Farren Ray suffered a hamstring injury in the second term and took no further part in the match, before Mason Wood suffered a suspected medial ligament injury in the third term, leaving the Kangaroos with just two on the bench in the last quarter. Eagles ruckman Scott Lycett could face scrutiny from the Match Review Panel for a high front-on hit on Jack Ziebell in the first quarter. Ziebell bounced back to his feet quickly and suffered no ill effects, but Lycett does have a poor recent record after he was suspended for one week earlier this year for striking. 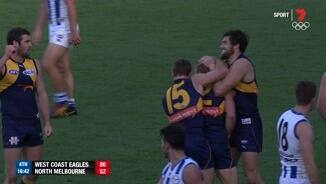 West Coast: The Eagles appeared to escape without any injury issues. 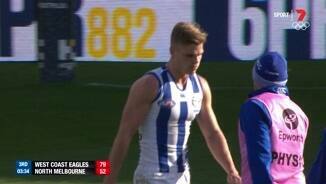 North Melbourne: Dal Santo was withdrawn pre-game due to illness. Ray injured his right hamstring in the second term and did not return. Wood suffered his knee injury when Will Schofield accidently fell across his leg. Brent Harvey copped a left knee knock. He played out the game but required strapping and was hobbling throughout. Swallow also copped a knock to the knee in the last quarter. The Eagles will play at the MCG for just the second time this season when they face Carlton on Sunday. 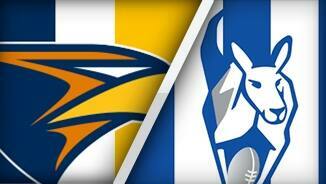 The Kangaroos face Port Adelaide off a six-day break at Etihad Stadium on Saturday.